According to Jain tradition, there have been twenty four Tirthankaras, all-knowing teachers who have built a pathway from the cycle of suffering Samsara, to an eternal liberation, Moksha. The last Tirthankaras is the most famous and is regarded as the founder of Jain religion. He lived from 599 to 527 BCE. However these dates are highly inconclusive as the practice of written records was still not prevalent those times. The story of Mahavira, nevertheless, is a fascinating one and says much about his influence. According to Jain legends, Mahavira first occupied the womb of a pious Brahmin woman, Devanada. He had a special dream and because of that, she and her husband knew that this was a special child. However in a strange twist of fate, orchestrated by the God Indra, Mahavira was switched over to another woman who belonged to the Kshatriya lineage and her baby girl was switched over to Devanada. When Mahavira was born, nature rejoiced. He was blessed by Gods, Goddesses and Angelic beings. Indra was so pleased by the parents of Mahavira, that he lifted the child upwards to heaven so that he could be righteously honoured. While in heaven, there was a festival where he was bathed and adorned. When Mahavira returns back to the earth kingdom of his father, everybody rejoices because all the people experienced great wealth and fortune. Because of this, they named him Vardhanama which means prosperous. Legend also says that as a child, when Mahavira was playing with his friends, a large cobra attacked them. But Mahavira flung the hissing snake away saving all of his friends. Another story says that, once a demon tried to deceive Mahavira by being disguised as a child when he was playing. Suddenly, the monster grew enormous in order to attack him. But Mahavira made him shrink down by blows and the demon begged for mercy. This is how Vardhamana came to be known as the great hero, ‘Mahavira’. Mahavira grew up as a strong and stout man but he refused to participate in hunting unlike his companions of that time. He denounced killing animals and preached that we should all treat others the way we wish to be treated ourselves. Although some Jain texts say that Mahavira was a celeb all his life taking the vow of Brahmacharya or Chastity, there still exists enormous texts which say that he was married to Yashoda as per his parents’ wishes. He is also believed by some to have one daughter from that marriage named Priyadarshana. After his parents died, Mahavira sought to renounce the world and seek enlightenment, and asked permission from his brother to do it. Mahavira explained to his family as well as his kingdom why he wanted to renounce his worldly life. He said that he must follow a higher cause of life rather than just focusing on storing worldly riches. As Mahavira was preparing for renouncement, he opened up the treasury and distributed all the wealth of his family to the people of his kingdom. After his sacred bath, Mahavira was carried on a beautiful carriage to an Ashoka tree where he pulled out all the jewels and clothes that he was wearing. He also pulled out all his hair in five fistfuls. Then he was presented with a beautiful white shawl to cover his naked body. Mahavira in his radiance endeared to all as he gave off an enchanting aroma of sandalwood. In the beginning of his journey to enlightenment, a poor Brahmin once asked for gift from him. Mahavira offered the Brahmin a part of his beautiful white shawl which was bestowed on him by Indra. 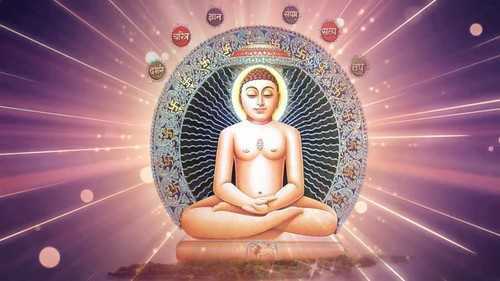 Mahavira was one of the earliest preachers of the policy of Non-violence or ‘Ahimsa’. He believed it to be one of the principal truths of life and taught everyone to forgive the other and emphasized on the futility of violent acts. This policy of his non-violence not only extended to humans but animals too, came under its ambit. He believed that any physical harm inflicted on any living being be it animal or human will affect once destiny and karma and he will never be freed from the perpetual cycle of reincarnation. Mahavira believed that the existence of soul is a reality just like the existence of the sun, moon and the earth. According to Mahavira, the entirety of existence can be divided into three parts- ‘Jiva’, ‘Ajiva’ and ‘Dravya’. Jiva is mortality and everything that exists in the world and gets attached to worldly pleasures and desires and suffering. Ajiva are dead things, while Dravya is the soul which is permanent even after the death of an individual. This idea is in contrast to the beliefs of Buddhism where non-existence of soul, ‘anatta’ is given paramount emphasis. Mahavira believed and preached that truth is a very versatile entity and cannot be expressed in the fullness of its meaning. Truth is just a matter of perspective and expression. The actual accuracy if it is untestable. What we can expect to do is to merely express it partially and inaccurately. Mahavira is one of the greatest monks to have ever abode the worldly existence and after almost 2,500 years, is still considered a source of inspiration by many notable people. Famous scholars and statesmen like Rabindranath Tagore and Mahatma Gandhi have revived his teaching to the general population and used them as a source of inspiration during India’s freedom struggle.